After the horrible, embarrassing loss yesterday to the UCLA Bruins 34-12, what can we expect for the rest of the Longhorn season? The team that showed up this weekend gets blown out by Oklahoma, but it’s a rivalry game, so who knows? I don’t really expect it to be close, however. Loss. This one could be bad. We’re down, they’re up, it’s at their house, and they’re very angry. Big loss. 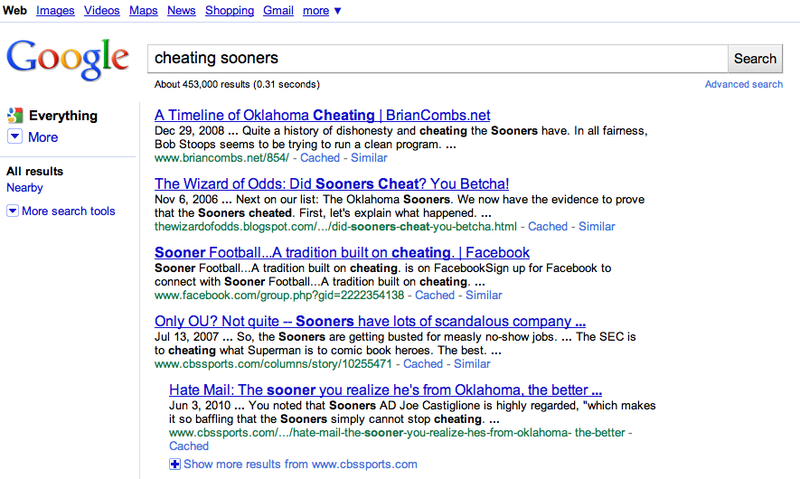 A post I wrote about eighteen months ago on the Oklahoma Sooners is now first on Google for [cheating sooners]. Sweet. This is now one of my site’s favorite rankings. The Big 12 Conference is dead; it just doesn’t know it yet. There is no question that the Big 10 Conference intends to grow. The only question is how many they add, and who they take. Sun Bowl Oklahoma Sooners vs. Stanford Cardinal December 31, 2009, 1pm Central El Paso, Texas Network: CBS Oklahoma fielded their worst offense in the Bob Stoops era this year. Injuries kept Sam Bradford out for most of the season, and the offensive line has as many holes as a TSA security plan. I will always take an ugly win over a pretty loss. And Saturday's 16-13 win by the Texas Longhorns over the Oklahoma Sooners certainly qualifies as an ugly win. Especially the first half, where Texas managed only 59 yards of offense (compared to Oklahoma's 192). Colt McCoy was sacked four times in the first thirty minutes. Last night's home game against the Oklahoma Sooners was one of the greatest in the Rick Barnes era. I hate to say it, but OU is a great team, and will likely make a deep run in the playoffs. But Texas dug deep and was the better team on Saturday. Stoops! He did it again! A fantastic tribute song to Big Game Bob Stoops and his bowl record by Ryan Parker.